The Middle East stands as the largest crude export region in the world with about 20 million b/d of outflows annually; however, what is perhaps less realized is its growth potential as a clean product export region. We are beginning to see a fundamental change in the Middle East petroleum industry, with initiatives from government entities to diversify away from reliance on upstream revenues and towards a wider scope of product exports. As a result, the Middle East has expanded refinery capacity to reach 9.4 million b/d as of the end of 2017 from just 8.4 million b/d in 2013 with further expansion to reach 10.8 million b/d by 2022. Refinery intake is likely to rise to 7.5 million b/d by the end of this year, before climbing to over 8.6 million b/d in 2022, supporting a 14.4% gain in clean product supply. This coupled with just 5.5% growth in clean product demand through 2022 will increase the exportable balance by 680,000 b/d (Figure). 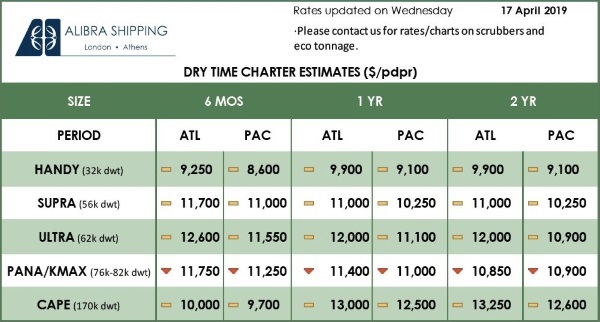 We emphasize this as one of the most important themes to unfold over the next five-year period, not only for its negative impact on dirty tanker demand from the region, but also its contribution to evolving clean tanker trade flows East of the Suez Canal. In order to understand how tanker trade flows are likely to adapt to this development, we must look at the balance of clean products in surrounding regions. Where we see significant demand for clean product imports is in South East Asia as the growth in regional clean product supply will not meet the demand requirements of rapidly expanding economies within the region, effectively increasing the CPP deficit by 213,000 b/d from 2017 to 2022. Increased refinery activity in China is likely to elevate clean product supply within the Far East by 600,000 b/d year-on-year in 2018 and nearly double the balance to 830,000 b/d. Some of the growth will serve the South East Asian market; however, over the long-term as CPP demand in China increases, the balance for export is expected to tighten to 610,000 b/d and other supply stream will be required to fill the gap. Traditionally, South East Asia also imports CPP from India; however, the long-term outlook for this region points to a tightening of the balance for export. With GDP growth of over 7.0% expected in India through the next five years, demand growth for clean products is likely to amount to 5% per annum through 2022, whereas supply growth is projected at just 2.0% per annum. The balance of CPP for export, which is estimated at 770,000 b/d this year, is likely to fall significantly to 250,000 by 2022. On this basis, the Indian Sub-Continent’s status as a primary supplier of CPP to the East Asian market will wane over the long-term. Due to these developments, we expect the Middle East to increase its presence in the global clean product market with growth concentrated in volumes shipped to the East. 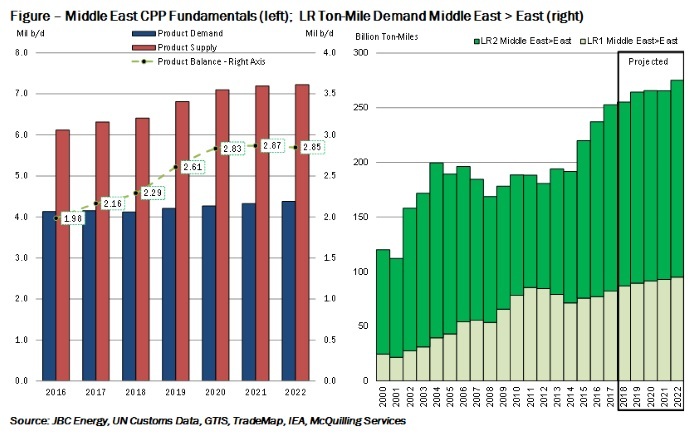 According to our ton-mile demand forecasts, clean product tanker demand from the Middle East is on track in expand by 19% through 2022, supporting LR volumes to the East particularly (Figure). 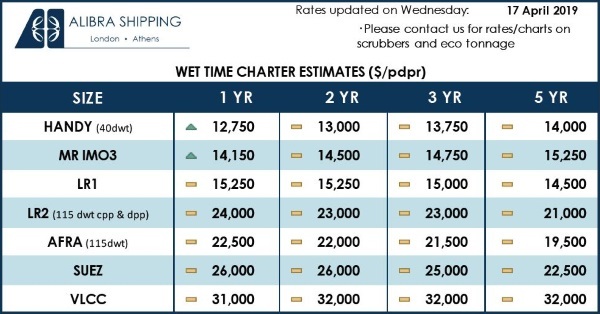 When coupled with an improving clean tanker supply outlook, we forecast TC1 to rise to average WS 117 in 2021, while TC5 is pegged at WS 131 in the same year.